A delay in finding a murdered woman's body has been referred to the professional standards department of South Yorkshire Police. Alena Grlakova's naked body was discovered concealed in a dried-out stream bed in Rotherham on 9 April. Ms Grlakova, 38, was found nearly three months after she was reported missing, according to The Star newspaper. 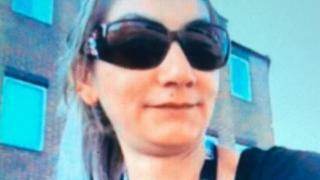 Police found her body near the Fitzwilliam Arms Hotel, where she was last seen alive on 26 December. South Yorkshire Police said: "The area was searched in February and following a review of all of the search areas, it was revisited earlier this month. "The force's professional standards department has been made aware." Ms Grlakova was recorded on CCTV leaving the Travellers Inn in Rawmarsh Hill at about 19:00 GMT on Boxing Day. She was then seen on Scrooby Lane going towards Mangham Road at about 20:30 GMT. Post-mortem tests failed to establish a cause of death. Ms Grlakova, from Slovakia, had come to Rotherham for "a better life and education" for her four children, her husband said. On Friday officers appealed for help in finding her clothing, showing a black sweatshirt like the one she was wearing. A 45-year-old man arrested in connection with Ms Grlakova's death has been bailed pending further inquiries.